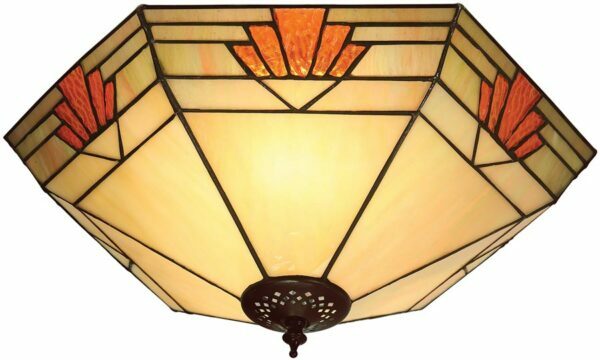 The Nevada Art Deco style flush 2 lamp ceiling light, a simple design inspired by the heat and golden sands of the Nevada desert. A classic Art Deco design brought to life in warm colours from the desert. The Art Deco motif symbolizes hot melting sun in rippled translucent reds and amber that refracts the light at different angles. The border with deeper tones of desert skies finishes the shade in a golden sand wash. Held in place by a dark antique finish lower finial. The Nevada Art Deco style flush Tiffany ceiling light will bring warmth and a sunny disposition int any room.